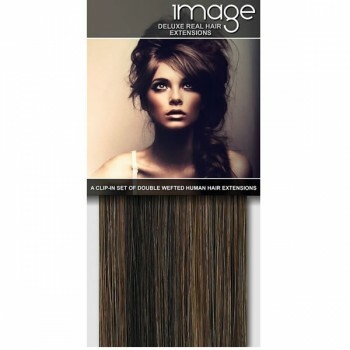 As official stockists, we're delighted to be able to offer Deluxe IMAGE hair extensions to our customers at great prices. If you're one of the lucky few that has naturally thicker hair or you just want glamorous volume, then the DELUXE double wefted clip in range is perfect for you. This full set of 26" clip in extensions is luxuriously thick and is made by hand using only the highest quality 100% Remy Human Hair, allowing you to create stunning styles quickly and easily. Image deluxe hair extensions are silky soft and smooth with every 26" set including over 170 grams of the finest quality real hair. Featuring silicone clips on every section, you can rest assured that once they are fitted in they will be completely invisible and thanks to the colour choices, will blend seamlessly with your hair. Your friends and family won't believe it when they see how long and luscious your hair suddenly is!